They say the plastic is still available but I’m sure it will be permanently gone in the near future. I agree, great designs! The designs are nice and reasonably priced. I can see myself buying these to use as gift bags for birthdays and Christmas. While this isn't a major issue for me, I have to agree that the designs are nice. So, if you're going reusable at least they came up with designs worth carrying around. Saw these in late January at one or two spots. Design is nice. I like the design but I'm dreading the day they go the Disney Store way and make you pay for a bag or get no bag at all. Despite being reusable bags I highly doubt that any guests who bought something on day 1 will take that bag with them to the parks on all other days just in case they may want to buy something. So in practice, anyone who shops without a plan will end up paying for a bag every single time they buy something. We don't need anymore plastic bags to bring home, so on our last trip we've started to bring both a reusable cloth bag and also a small plastic bag. They take up little or no space in your backpack. Reduce, Reuse, Recycle. It's a no brainer. IDespite being reusable bags I highly doubt that any guests who bought something on day 1 will take that bag with them to the parks on all other days just in case they may want to buy something. So in practice, anyone who shops without a plan will end up paying for a bag every single time they buy something. That's all part of the evil plan! I'm just glad they came up with something nicer design-wise than what they give you shame you into buying at the Disney Store. The last time I came home with one of those my SO asked me if I'd stolen one of the bags they hand you for use in the store and really, that's exactly what it looked like in plain dark blue with the mickey outline on the side. These at least look like something that would be good for gift bags and such with designs and colors that are nice. I won't be happy when/if these become the only choice because like everyone else, I don't want to end up having to buy 3 dozen of these because I never remember to cart my previous one back to the parks with me but as an option, these are nice and would make nice related gift bags. 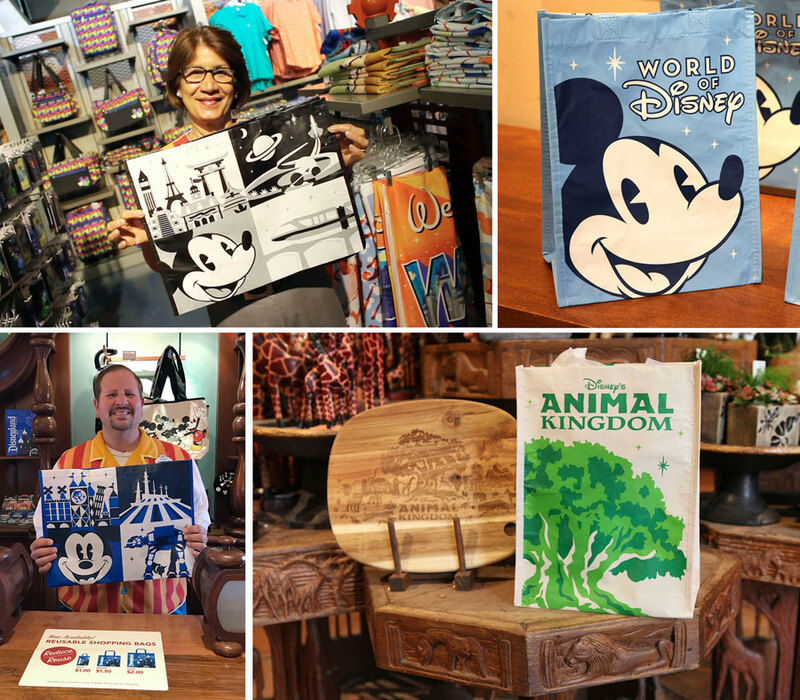 We are happy to see that the bags are specific, and not generic Disney Parks. I’m curious how, in the long term, this initiative might impact hotel guests shipping purchases back to their hotel. There seems to be lots of plastic waste with that system - bags in bags, then stapled so you can’t reuse them. Management has realized this will cause a short term drop in merch sales.